Help us learn more about our collection! With the sheer volume of artifacts that have been acquired by the National Law Enforcement Museum – more than 7,500 to date – we can’t always devote as much time to researching individual objects as we would like. So we are calling on you to help us uncover some of the stories behind our objects. On a regular basis, I will post pictures and any information we have on specific objects in our collection. We want you to tell us anything you may know about the item. All information is welcome; sources and citations are requested when possible. Please email Jeni Ashton at jeni@nleomf.org. Thank you. Who do the badge numbers belong to? We have seen that the first "officially carried" weapon of the NYPD was the Colt .36 5-shot percussion revolver. But I’ve also found references to Roosevelt having problems with poor marksmanship and back firing weapons after this weapon was adopted. After conducting tests, the NYPD decided to issue the Colt New Police as the standard revolver for the NYPD. Does anyone have any insight on this? We are also looking for information on the standardization of law enforcement equipment in the late 1800s. So, if you have an early-issue police weapon or know of information when police departments began issuing standardized weapons, let us know. With the recent release of "Public Enemies," I began to think about the legend of John Dillinger (played by Johnny Depp) and wondered how the movies would treat his story. Often 'historical' mainstream movies gloss over some of the little details that can make a difference in how the public reads the main character (in this case Dillinger). Now it is true, as the movie depicts, that in real life the public rooted for and avidly followed Dillinger in the newspapers and on the radio, despite his murders. He and his gang were responsible for killing 12 law enforcement officers, and generally wreaking havoc. 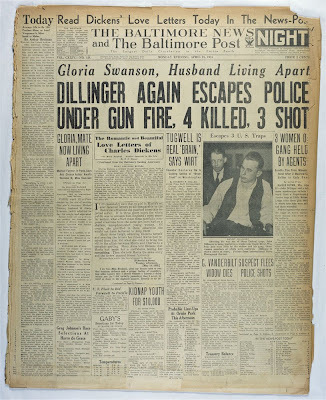 When I was looking through our collections catalog this morning, I came across this newspaper article from April 23, 1934, titled, “Dillinger Again Escapes Police under Gun Fire, 4 Killed, 3 Shot” (above). The article describes the chase, shootout, and escape of Dillinger and many of his cohorts, and notes the death of FBI Special Agent W. Carter Baum in Eagle River, WI. I was happy to find that this scene and Special Agent Baum’s death are shown in the "Public Enemies" movie. In this specific scene, this seems to be a small step forward in making a somewhat accurate historical blockbuster movie, even if there are moments in the film that are slightly exaggerated. Our intern Anna found that Special Agent Baum left behind a wife and two daughters. Anna wrote, “Can you imagine becoming a single mother in the middle of the Great Depression?” This question made me pause for a second. The movie did give a nod to law enforcement; but, it might have been nice if the movie showed the effects of Dillinger’s rampaging across the Midwest. It could have given the law enforcement officials a little more depth, and hopefully gotten the viewers to think beyond the fast action bad guy stuff.